This Flowering Japanese apricot is a very small tree with fragrant, white, semi-double flowers that are sometimes flushed with hints of pink. Literally translated as 'Memories of Mother', Prunus mume 'Omoi-no-mama' has beautiful almond scented flowers appearing in March-April. Foliage is small, mid-green and slightly glossy with orange and yellow autumn colour. The tree itself is compact and slightly lollypop shaped, with a straight, clear stem and a bushy head. An estimated height and spread of 2.5 x 2.5 metres can be expected in 20 years, making 'Omoi-no-mama' suited to growing in a pot if you wish. Grows well in all but very wet or chalky soils. Prunus 'Omoi-no-mama' would make a stunning feature tree in any garden. We also have a pink flowering Japanese Apricot, Prunus mume Beni Childori. Our pot grown Omoi-no-mama Flowering Apricot trees can be planted at any time of the year. Choosing a location away from strong winds protects the blossom display. Start by removing weeds and grass within a metre of your desired planting hole. Dig a square hole as deep as your root mass and approximately 1.5x as wide. To help the tree establish more effectively, sprinkle root grow in the hole. Remove the pot, gently loosen the roots and place into the planting hole. Mix 50% of the original soil with 50% compost, fill in the hole and firm around gently. Avoid banking the soil up around the collar of the tree. 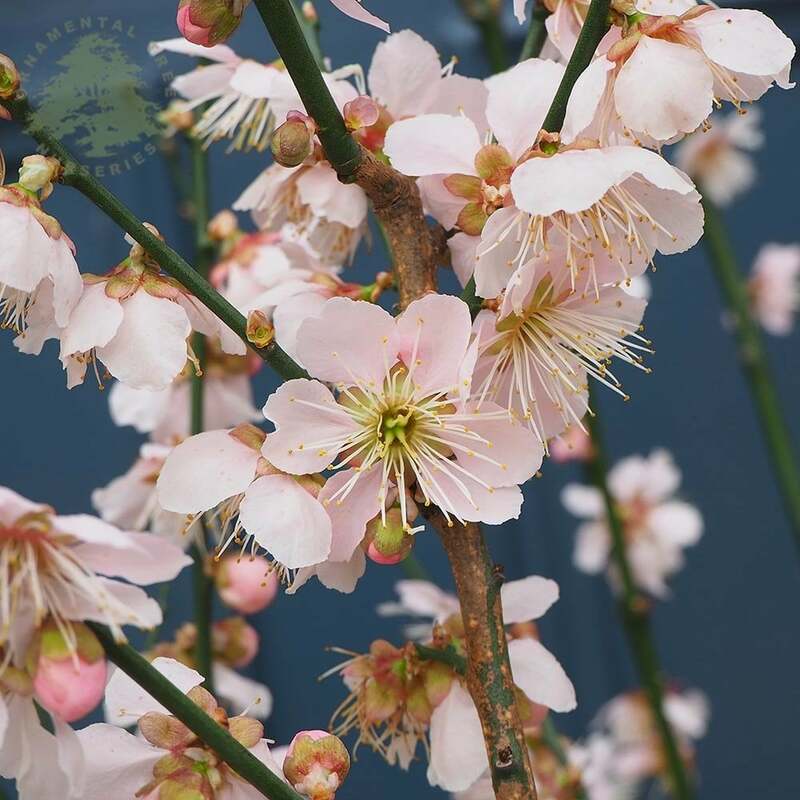 We recommend planting Flowering Japanese Apricot trees (except multi-stem forms) with a stake and tie kit to ensure the roots are well anchored - instructions are in the planting guide. When planting Flowering Apricot trees in spring or summer, water well for the first few months. Increase watering if there are extended periods of hot or dry weather. When planting in autumn, you may only need to water a little. See Irrigation kits. Although it is possible to leave your Flowering Japanese Apricot tree to its own devices, if you prune it for the first few years it will create a more balanced branch framework. Prune after flowering i.e. after the petals have dropped but before the new shoot growth appears.